The fourth studio album from Brazil's Sepultura represents a marginal evolution compared to Beneath The Remains (1989). The band continue with their ultra-aggressive thrash assault, Arise finding a few new highlights where the melodies and compositions move beyond repetitive bludgeoning, but the overall sound remains more the outcome of pummelling than refinement. 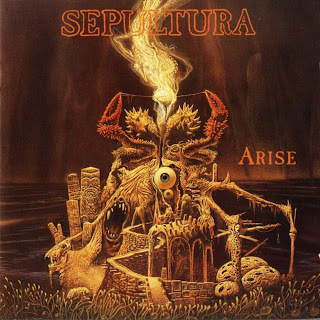 Perhaps the band's most focused album, on Arise Sepultura sound controlled and tightly knit. Max Cavalera's vocals are delivered through the clenched throat of an angry man. On guitar, Andreas Kisser comes up with sturdy riffs and maintains a manic pace, but the quality of solos is generally lacking. Paulo Jr. and Igor Cavalera on bass and drums respectively are notably, and pleasingly, to the fore. Opener and title track Arise is the best song on the album, Kisser's busy staccato riff setting a bar that the rest of the CD fails to duplicate. Dead Embryonic Cells is ambitious but stumbles against the band's still-limited domain, although at the 3:25 mark there is a terrific signature change, what resembles a breakdown in early form, and while riding Kisser's axe the track ascends into an impressive few moments of what would become melodic death metal. Desperate Cry also aspires towards a sound broader than Sepultura's typical ferocity, and sporadically finds more expressive melodies. The rest of the album is good as far as Sepultura's fundamentals allow. The six tracks that end the album are undoubtedly combative, fast, and furious. But they are also repetitive, monotonal, and rarely offer any startling moments. Most of Arise is straight ahead dense thrash delivered with a pugnacious attitude, take it or leave it. Produced by Scott Burns and Sepultura. Mixed by Andy Wallace. Recorded and Engineered by Scott Burns. Mastered by Howie Weinberg.